It really hasn't been that long, but I miss blogging. I know I've been able to post a couple of times over the past few weeks, but it's hardly been enough. Dead week and finals week consumed my life, and I've barely had a chance to take photos or comment on my favorite blogs. Fortunately, I had my last "final" (it wasn't a test; I just had to show up, but the professor wasn't even there) this morning, and break is about to begin, so I'll have more time from now on. A few of my good friends are graduating, and I'll be gone from all of my Illinois friends for a month, so any time not doing homework or studying has been spent with them. This whole being at home for a month thing is pretty bittersweet. On one hand, I'm sad to be away from all of my friends here, but on the other...it is freezing here. California weather cannot come soon enough. I took these photos yesterday while on a coffee date with Katie and Lexi, and we all almost froze to death taking them. I'm so happy to have them here since they're two of the only people on campus who would stand outside sans coats for a few minutes just to take pictures of our outfits. 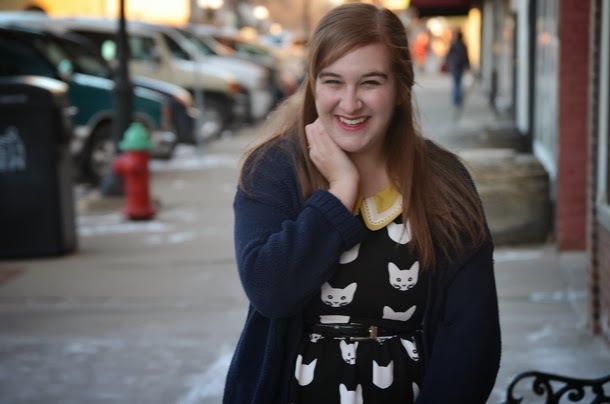 I decided it was time to break out the cat dress again, and when I realized that it had been forever since I donned a feminine collar, I knew I needed to fix that. This dress really is a great layering piece, which means that I'm going to have to see what else I can do with it soon. Side note: since just about every blogger on the planet owns this dress, does anyone else think it's time for some sort of link-up? P.S. Please shop my closet for some cheap clothes so I can afford to buy all of the Christmas presents I need to get! As for the rest of my time in the Midwest this year, I'll be hanging out with Mary today, getting dinner with Jenn and our friend Aaron tonight, and then going to see "The Hobbit" at midnight. There are so many good movies coming out, I almost can't handle it. I might have to skip buying Christmas presents and just buy movie tickets instead. Sorry, friends and family. I have to see "Inside Llewyn Davis" and "American Hustle" instead. You understand. yay, glad you're done, congrats!! just one more semester right? : ) and wow, I get get behind that sort of final,just showing up. love this dress on you, such a pretty print! 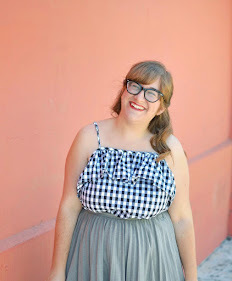 I think I'm the only blogger that doesn't have that dress because they didn't have my size when I went to buy it :/ That collar peeking out is so darn cute and I love the color it adds. Yay for winter break!! Congrats on finishing the semester!! This dress is adorable! OMG I need that dress it is gorgeous! Okay, you are just so stinking adorable! I LOVE that dress. This is the first time I've seen it anywhere in the blogosphere. I totally understand what you mean about missing blogging; I've been making myself blog less because I need to prepare for having a baby, and I miss doing it all the time! (I'm used to posting five times a week). But at least we get to see some of your adorableness! AH your closet shop. I want it all. Haha! I love this dress on you! You are always the busiest girl, SLOW DOWN. Also I'm so jealous that you are going to Cali where it's warm. I hate this weather. I am not sure how I am still not used to it. Oh, and to answer your question -- I work at a local coffee shop. I'm an openin' barista. Turns out people need their coffee before the sunrise. I am SO jealous you get to go somewhere warm for christmas! Ahh I see what you did there, with the title! U so clever! I love this outift! 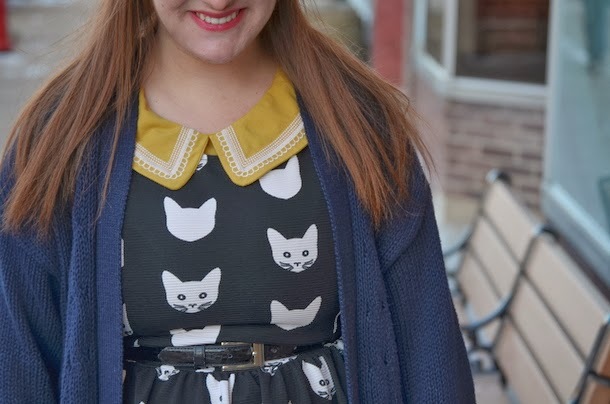 The kitty dress looks great with the collar peeking out. I have that dress - I wear the crap out of it! haha. I have yet to layer it because....honestly, its a little tight around the bust area these days. I'll have to give it a try though! Hooray for being done with finals! It feels pretty amazing to be on break. 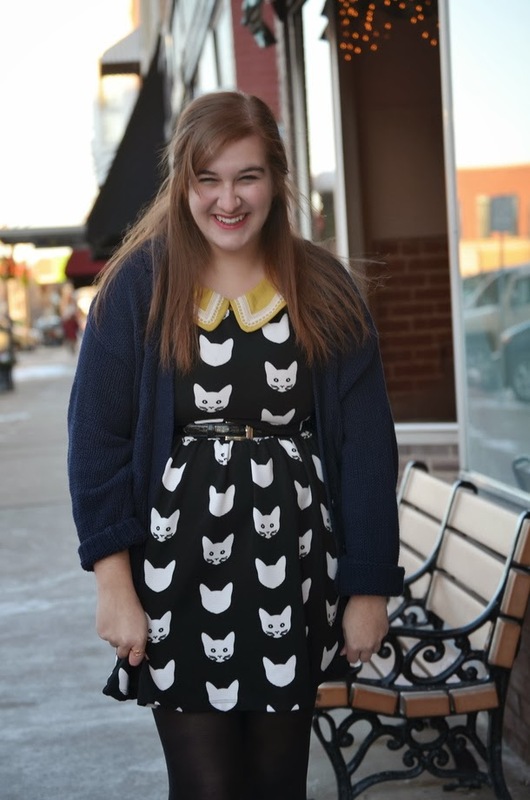 Also this cat dress is so cute. I love seeing everyone style it differently. I really love the yellow collar peeking out from under it. So much cuteness! Oh, how cozy and darling an outfit. I'm glad you got through finals okay! You always have the best prints on your clothes - this is another piece that is eclectic and fun! Obsessed with this print! It's so much fun!